Caldwell wanted experience and believes Stuckmann fits the bill. Gary Caldwell wanted a goalkeeper with experience and ‘authority’ for the League One relegation battle and he believes Thorsten Stuckmann fits the bill. This week he gave his public backing to new signing, despite a nightmare finish to his Spireites debut on Saturday. The German was heading for the plaudits and a clean sheet having made some big saves, including an eye catching right handed parry to beat out a spot-kick, but disaster struck. Stuckmann was first beaten by a wonderful Andrew Tutte strike that no goalkeeper could be expected to save, before he miscontrolled a Sam Hird backpass and gifted George Miller a winning goal. The stopper, released by Partick Thistle at the start of January, took a heavy touch and could only watch in despair as Miller rounded him to find the empty net. Caldwell was pleased with the 35-year-old’s display however. “I thought he performed extremely well,” he said. “Obviously the disappointment at the end was very hard for him to take because overall I couldn’t ask for any more in terms of how commanding he was, the saves he made, the calmness he brought to the defence. Stuckmann began his career in his native country’s second and third division with SC Preußen Münster, Eintracht Braunschweig and Alemannia Aachen. His first experience of English football came in 2011 at Preston North End, where he saved a spot-kick on his Football League debut. In June 2015 he joined Doncaster Rovers and played 36 times for them last season before his release. Five appearances for Partick followed during the present campaign. 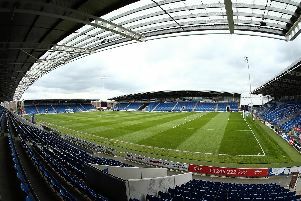 There’s no doubt that Stuckmann has been there and seen more than fellow Chesterfield keepers Ryan Fulton and Lloyd Allinson, aged 20 and 23 respectively. “His experience,” said Caldwell, when asked why he’d brought the German in after a trial period. Fulton, on loan from Liverpool, has played 29 games for Town, deputising all season for injured first choice keeper Tommy Lee.